For National Poetry Day we highlighted one of the poems in our collection: a rollicking travelogue that is sadly anonymous. 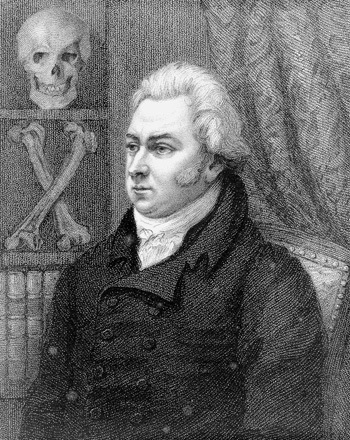 Much of the poetry in the Wellcome Library is anonymous – in many cases, it is amateur material bad enough for the author to be grateful for a cloak of anonymity – but our archives do also contain material by ‘proper’ poets and on this 21 October, we highlight one born on this day nearly 250 years ago: Samuel Taylor Coleridge (1772-1834). 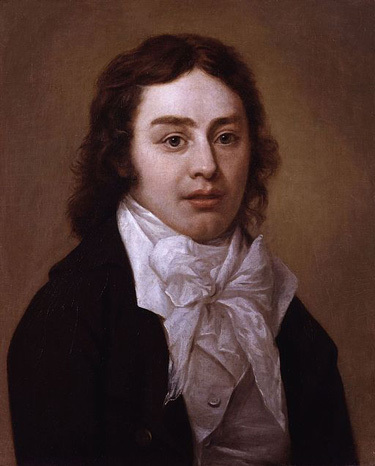 Samuel Taylor Coleridge, Romantic poet and co-author of ‘Lyrical Ballads’. Image credit: National Portrait Gallery. Ask anyone to name some poets that make up the approved canon of English literature prior to 1900, and the chances are that it will be heavily biased towards the Romantic poets. A generation that did much to shape popular views of poets subsequently, as people with flowing locks and furrowed brows, thinking deep thoughts about Nature. Among these, Coleridge is a key figure.One of the founding texts of the British Romantic movement is the anthology ‘Lyrical Ballads‘, published in 1798 by Coleridge and William Wordsworth: the majority of the book’s poems were by Wordsworth, but it was Coleridge’s ‘The Rime of the Ancient Mariner‘ (the longest poem in the volume) that gathered the most praise and attention. 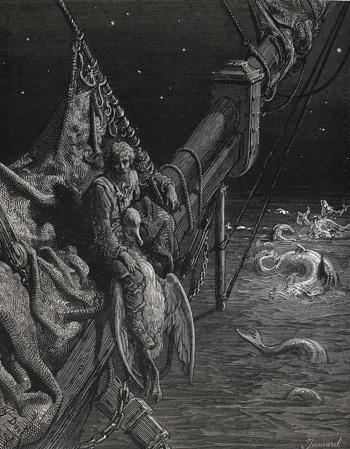 Illustration from the ‘Rime of the Ancient Mariner’. Published 1877, Leipzig, Germany. Illustrated by Gustav Dore. 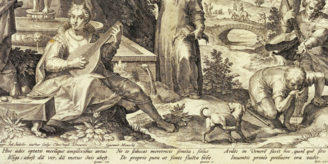 Image Credit: British Library. For some years Coleridge burned brightly as a poet, forming part of a circle of writers centred on Wordsworth’s home in the Lake District. By the early years of the 19th century, however, his output was waning; in part because he was devoting more energy to philosophy and an attempt to import German Idealist concepts into the English tradition, but chiefly because of personal problems. His marriage, never happy, ended in separation; he quarrelled with Wordsworth; he had periods of intense anxiety and depression; and, most notoriously, in attempting to self-medicate his way out of his troubles, he had become addicted to laudanum (a solution of opium in brandy). This addiction was to overshadow the rest of his life: after ‘To William Wordsworth‘ in 1807 he wrote little poetry of worth, and his prose works were chiefly disorganised sketches towards the great philosophical work that he was, he assured the world, going to write one day, just as soon as his addiction was cured. Extract from Samuel Taylor Coleridge’s letter to Thomas Allsop in 1820. Wellcome Library reference: MS.8590. Portrait of Sir Astley Cooper, 1819, etching by Henry Meyer after Francis Simoneau. 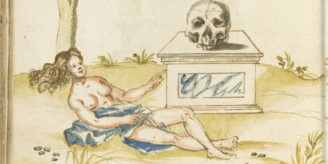 Wellcome Library reference: 2039i. 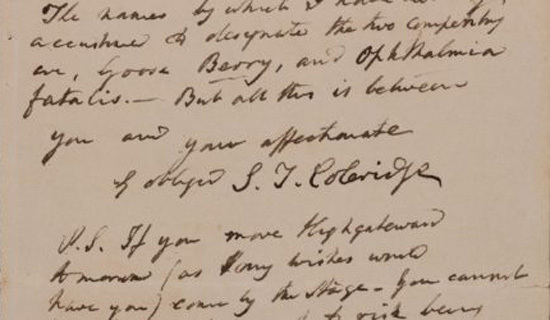 A ‘proper’ poet, then, but the letter held at the Library shows other sides of him. He appears here as a man immersed in a medical milieu and involved in the intensely personal medical politics of the time; but also, underlying that, as a man whose mental health and drug addiction had derailed his talent, whose best work was long behind him, a gift burnt out. The trouble with being a ‘proper’ poet relying on inspiration is that the inspiration can dry up; a problem that the anonymous hacks whose rhyming couplets make up most of our poetic holdings did not have to worry about.